Scientists from the Energy Safety Research Institute (ESRI) at the Swansea University have discovered a technology for transforming waste carbon dioxide into a molecule that forms the basis of producing plastics. The ability to use global ethylene extracted from carbon dioxide (CO2) is enormous, making use of half a billion tonnes of carbon emitted each year and counteracting global carbon emissions. The CO2 utilization group uses water, CO2, and green electricity to produce a sustainable form of ethylene at ambient temperature. Primary to this process is an innovative catalyst—a material formulated to accelerate ethylene formation. We have demonstrated that copper and a polyamide additive can be combined to make an excellent catalyst for CO2 utilization. The polyamide doubles the efficiency of ethylene formation achieving one of the highest rates of conversion ever recorded in standard bicarbonate water solutions. For synthesizing the catalyst, the CO2 utilization group worked in partnership with the University of Nebraska-Lincoln and the European Synchrotron Research Facility in Grenoble. The potential of using CO2 for making everyday materials is huge, and would certainly benefit large-scale producers. We are now actively looking for industrial partners interested in helping take this globally-relevant, 21st-century technology forward. The study has been reported in ACS Catalysis, an American Chemical Society journal. The lead author of the study is ESRI researcher Dr. Sunyhik Ahn. The co-authors of the study are ESRI scientists Dr. Russell Wakeham, Dr. Jennifer Rudd, and Dr. Shirin Alexander; graduate student Aled R. Lewis from Swansea University, Wales; Dr Konstantin Klyukin and Professor Vitaly Alexandrov from the Department of Chemical and Biomolecular Engineering, University of Nebraska-Lincoln, United States; and Dr Francesco Carla, researcher at the European Synchrotron Radiation Facility, Grenoble, France. 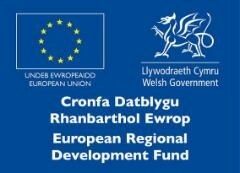 This study was supported by the UK Engineering and Physical Sciences Research Council (EPSRC), with additional funding from the Welsh Government through the Sêr Cymru program, the Welsh European Funding Office (WEFO) through the FLEXIS research operation, the European Synchrotron Radiation Facility, and the U.S. Department of Energy.